It’s not entirely news that the under-equipped Kurdish forces holding the front lines against ISIS in Iraq have accepted help from Iran. There have been reports of arms shipments from Iran to Iraqi Kurdistan since last summer, as promised military support from the West proved slow in arriving. 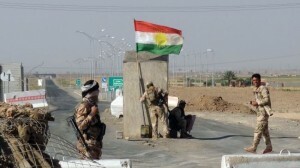 In fact, Kurdish President Massoud Barzani credited Iran with being the “first country to provide us with weapons and ammunition.” Some Iranian officials also claim their military has provided training to Kurdish peshmerga forces, although those claims have been disputed by both the Kurds and other sources within Iran. Masrour Barzani said the weapons shortage posed difficulties for the Kurds as they finally managed to push ISIS out of the battered city of Kobani. Kurds did the ground work while aircraft from the U.S. coalition provided support, but now they find themselves under-equipped for following up on their success in Kobani. Barzani further complained about all of Humvees and Abrams tanks provided by the U.S. going to Iraq, leaving them to make do with old Soviet armor captured from Saddam Hussein’s forces, and expressed deep skepticism that the slow delivery of fresh American supplies to Kurdish forces was due to any kind of “technical issue.” Part of the problem is an American law that forbids the direct shipment of arms to “sub-state entities,” which means everything has to go through Baghdad. The Iraqi government would not look favorably upon a big Kurdish military build-up, and it would be contrary to current U.S. policy about keeping the Kurds in Iraq. Barzani pointedly noted that the weapons he’s gotten from less constrained Western allies, such as Germany, have proven quite useful for taking out the American vehicles ISIS swiped from fleeing Iraqi forces. Presumably the rockets and other “specialized weapons” the Kurds have received from Iran have proven useful as well. Iranian arms in Kurdish hands are not a welcome sight for Baghdad, and it ought to disturb the Obama Administration more than it evidently does. Iran doesn’t want to see Kurdistan go independent, not least because Iran, like Iraq and Turkey, has a significant and restless Kurdish population. If Greater Kurdistan happens, it’s likely to gobble up a bit of Turkey and Iran, causing headaches for their governments. When President Barzani floated an independence referendum last summer, the Iranians called him “an emotional individual with secessionist slogans.” The last time Iranian Kurds got serious about secession, right after World War II, Barzani’s father was involved. But Iran loves the sight of Kurds trouncing the Islamic State, and a Kurdish minority in Iraq that feels gratitude toward Tehran while simmering with resentment for Baghdad would suit the Iranians just fine. Writing at the New York Post, Ralph Peters cited Iranian outreach to the Kurds as progress toward putting the old Persian Empire back together, along with the overthrow of Yemen’s government by Iranian-aligned Houthi rebels, Hezbollah working Iran’s will in Lebanon, sympathetic Shia forces making trouble in Bahrain… and of course Tehran’s client Bashar Assad looking solid in Syria, with the help of that other aspiring empire-rebooter, Vladimir Putin. President Obama seems to think this new Shiite empire will be easier to deal with than the psychotic death cults of Sunni ISIS and al-Qaeda. If the Kurds fall into Iran’s orbit, we’ll be one step closer to finding out. U.S. officials seem determined to win an argument with the Kurds over whether they are being deliberately under-supplied in the fight against ISIS. It sounds like the Kurds are growing weary of the discussion.